As Kathleen just wrote in her post about Alexander Skarsgard and the on-the-mouth kiss he shared with Nicole Kidman in front of Keith Urban when he was heading up to stage to accept his award, everybody calm down. In North America, we are too f-cking pearl-clutchy about these kisses. If this had happened in Europe, nobody would have noticed. And also, if you’ve seen Big Little Lies and know what those two went through to play those characters, to bring life to that storyline, it only makes sense that they would share a moment last night as a testament to the trust and respect that had to have been there for them to go to a place that was so vulnerable, so raw, and so dark. I heard it in the context of this particular performance, as Celeste, when she’s spoken several times about how long it took her to get over the role, how Celeste stayed with her, and, in some ways, broke her. To play Celeste with that kind of fearlessness – that eventually won her this award – she had to take time away from the young children she’s raising, who are at home with her: Sunday and Faith. So, to me anyway, it wasn’t a thing that she didn’t mention Isabella and Connor. 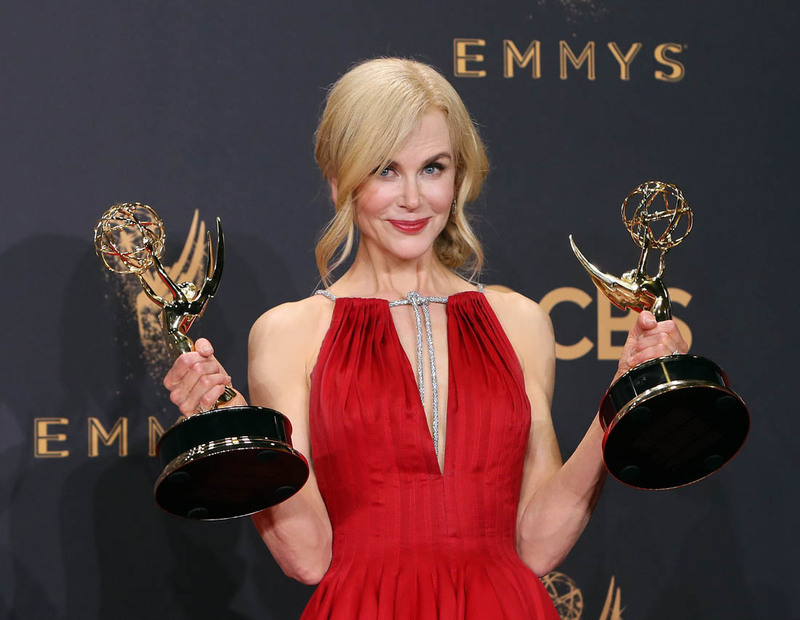 They aren’t the ones who weren’t tucked in when she was shooting Big Little Lies. "I can see now, for Lion, that it was important to me because I'm a mother with adopted children. This movie is a love letter to my children. [My character] Sue is deeply maternal and full of unconditional love, which is beautiful. That's why I wanted to do it. I relate to that. I feel that for my own children who are adopted. It's not about anything else other than 'I wanted you.' It's that deep and personal, and whatever your journey is, I'm here to love and support you. That's what I connected to." Is it fair to accuse her of forgetting two of her children? When, not even a year ago, she was referencing them in connection to her work, the way she referenced Sunday and Faith, and the impact her work on BLL would have had on them? Of course it’s also more complicated than that. Because Isabella and Connor are Scientologists and closer with their father. According to multiple reports, when Nicole and Tom Cruise divorced, she was declared a Suppressive Person by the Church Of Scientology. Scientologists are supposedly expected to avoid SPs. And there have long been rumours that Isabella and Connor have distanced themselves from their mother, who apparently resisted Scientology influence, in adherence to church rules. Do you remember Going Clear, the documentary that was released a couple of years ago about Scientology? According to former Scientologists, the Church was supposedly not pleased with Nicole’s reluctance to go all-in. And so they began to, allegedly, convince Tom that she was a negative influence. According to former Scientologists, he had her phone tapped. The Church has vehemently denied these claims. But…well… you know. With that in mind, it felt personal to me, what she was saying about domestic abuse. It felt…like it was close, and that it was real and profound pain for her. She has never publicly disavowed Scientology, because she has never wanted to disrespect her children, but if any of this is true, if Going Clear was true, if what Leah Remini says, and has been saying as loudly as she can at every opportunity, is true, can you imagine how painful it would have to be, to have had to endure so many years of estrangement from her kids? What would her choices have been? Sh-t and diarrhoea. You fight and you put your children on the biggest stage and you risk f-cking them up even more. You don’t fight and they’re “protected” in a sense, but you don’t see them. Given the backstory here, I’m not sure it’s fair to be mad at her for what she may or may not intentionally or unintentionally have omitted last night. Of course it’s very, very, very important to acknowledge adopted children to be as valuable as biological children. But this is such a unique and complex situation, I don’t know if calling her out here is the right response.